It is a long time I have not posted a report. Most of you already know that January has been a rather tough month for me. We are now right in the middle of the month, so there are still a few more weeks till I will be able to be fully on track! 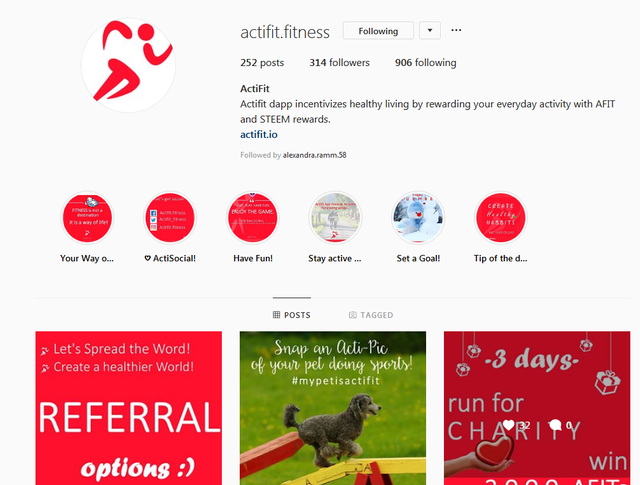 In this post, I will be presenting some statistics for the social media channels of @actifit. Since December 1st, we are posting daily updates at the social media channels. 👑 The social media champion was Instagram with a 28% increase in followers! 🐦 The second platform with a 22% growth was twitter! ♨ Steem had the smallest increase, but remains the KING with most of the followers (2106). 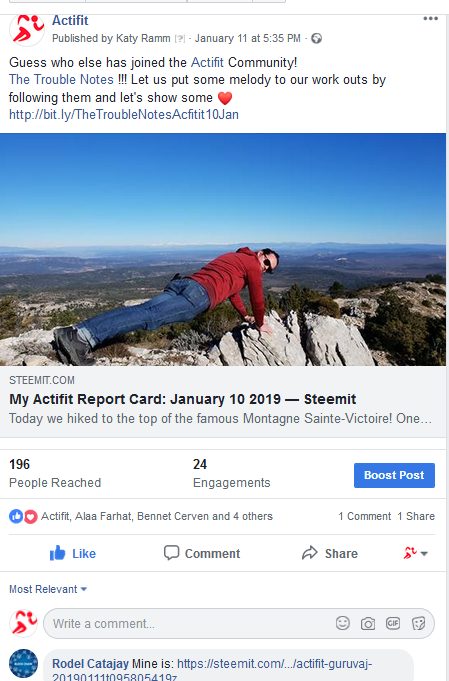 The steem account @actifit has been daily updating the users since day 1, in June 2018! The increase in followers was greater in instagram and twitter, because we use specific, popular hashtags when posting in these 2 platforms. We always respond to the queries, to the comments and to the messages we receive. We also follow back new followers and in the near future we will implement additional tools in order to unfollow inactive accounts. We understand that quotes and pretty girls always steal the show :) Along with popular hashtags of course! 22% increase and per day approximately 1.84 new followers! It was a nice 2 weeks time frame for Twitter, lots of engagement and mentions! We are very close to reaching 200 followers! Maybe it does not seem much, but it is an important milestone. As an account grows, so does the engagement, the brand awareness and the social media management becomes even more of a necessity. Let's find out your favorite tweets! The top tweet for January was about a health tip and earned an impressive 1748 impressions. 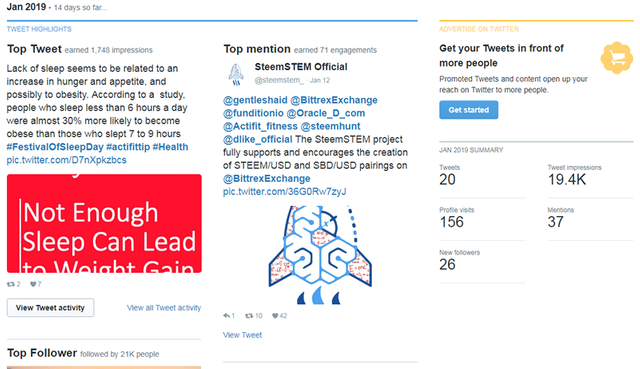 while the top mention regarded the recent campaign where every steemian can participate and reply to Bittrex on Twitter so that they can list STEEM/USD and/or SBD/USD pairing! In these 14 days in January, the Actifit account earned 19.400 Impressions and 156 profile visits (this is why the profile of an account is soooo important). In this month alone, 26 new followers were acquired. Something that is worth to mention is that we answered to support messages in Facebook and in Twitter. This is good, it means that our users use more means for contacting us and that was one of the goals! To make it easier for users to ask a question or to contact us for any issue they would face! It will take a few more weeks until we can have specific goals for the social media growth. We are actually happy seeing the community members to get to know each other and communicating with each other! 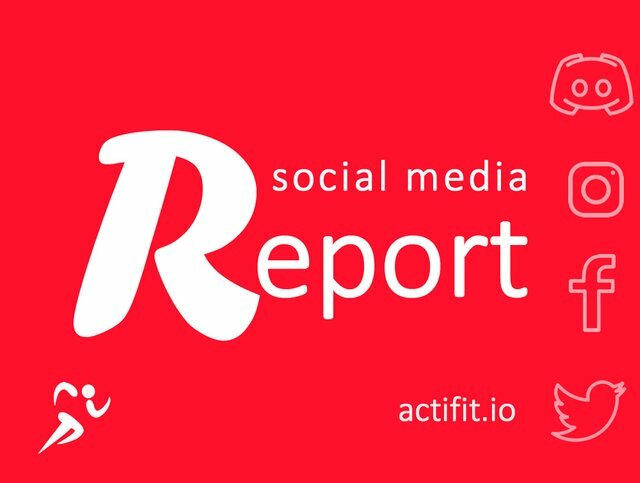 Thank you for providing this social media report for the Actifit project. The report is quite comprehensive. Well done! It is surprising to see that the growth in Instagram surpasses all other social media. Instagram used to be the least I could consider thinking about getting cool visibility for a project. Compare to Facebook and Twitter. Well, I believe that is changing now. It is great to see growth in all social media. Little or high, all social media had a certain percentage of growth which is very good for the project. I'd just suggest you put in more attention, and hard work to reach more potential actifitters. Again, thanks for providing this information. You are doing a great job. Hi, thank you so much for visiting and commenting! Twitter is not only for business data, there are many interesting discussions going on for just about any subject/niche you can imagine! Regarding Facebook, it is a place where people are hanging out usually to be entertained and motivated. In any case, when someone tries to expand their reach, these platforms should be certainly taken under consideration. No problem. If I could I would do one group and invite all cool steemians :) Maybe that's what's missing - more interaction and real meetings... Thank you too for comment upvote. 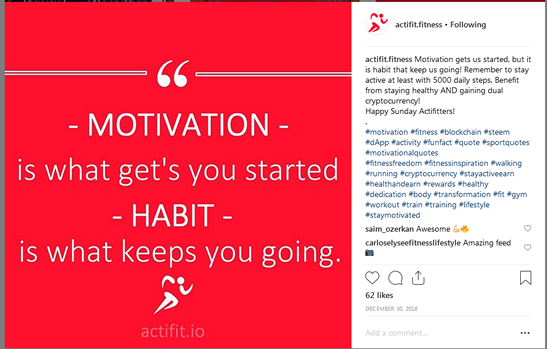 You've been accordingly rewarded 100 Actifit tokens, as well as an Actifit upvote. Your UA account score is currently 4.502 which ranks you at #1972 across all Steem accounts. Your rank has dropped 9 places in the last three days (old rank 1963). In our last Algorithmic Curation Round, consisting of 248 contributions, your post is ranked at #22.